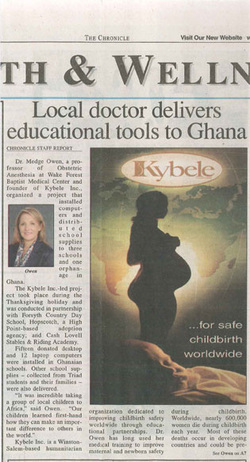 Dr. Medge Owen, a professor of Obstetric Anesthesia at Wake Forest Baptist Medical Center and founder of Kybele Inc., organized a project that installed computers and distributed school supplies to three schools and one orphanage in Ghana. The Kybele, Inc.-led project took place during the Thanksgiving holiday and was conducted in partnership with Forsyth Country Day School, Hopscotch (Adoptions), a High Point-based adoption agency; and Cash Lovell Stables and Riding Academy. Fifteen donated desktop and 12 laptop computers were installed in Ghanaian schools. Other school supplies – collected from Triad students and their families – were also delivered. Kybele Inc. is a Winston-Salem based humanitarian organization dedicated to improving childbirth safety worldwide through education partnerships. Dr. Owen has long used her medical training to improve maternal and newborn safety during childbirth. Worldwide, nearly 600,000 women die during childbirth each year. Most of these deaths occur in developing countries and could be prevented. In 2001, Dr. Owen established Kybele, who was the goddess of childbirth in ancient Anatolia (now modern-day Turkey). Owen was a Fulbright Scholar in Turkey (1997-1999) and helped establish and obstetrical anesthesia service at Uludag University. In September 2004, Owen returned to Turkey with a delegation of eight obstetric anesthesiologists from prestigious universities throughout the US and United Kingdom to teach regional anesthesia for childbirth. She also co-authored the first textbook of obstetric anesthesia, which was published in Turkey in 2004. Kybele brings American, Canadian, Australian, and European healthcare professionals together to work in teams that travel to host countries. Since 2004, Dr. Owen and her Kybele team members have conducted medical training in Turkey, Croatia, Ghana, Georgia, Armenia, Romania, Egypt, Mongolia and Brazil; sponsored 16 major in-country medical conferences; and trained hundreds of doctors and nurses. The Chronicle is Winston-Salem’s oldest (was established in 1974) and well-respected community newspaper. It is published each Thursday reaching an audited circulation of 7,000 people.